Update your modern rooms by introducing a new mirror into the space. From sleek minimalist frames to elegant leather wall hangings, this assortment of mirrors will add another dimension to your rooms. From Menu, The Kaschkasch Floor Mirror is a decidedly modern home accent that is designed with small spaces and apartment living in mind. The full-body mirror has a triangular shaped frame, making it easy to fit into the corner of a room. The thoughtful design also enables the mirror to lean flat against a wall, and even stand on its own in varied directions. There is a gap between the top of the glass mirror and the powder-coated aluminum frame, making it easy to hang clothing or drape scarves, belts, or necklaces. The Fairmont Wall Mirrors represent the perfect blend of rusticity and elegance. Each mirror in the series—round, long oval, and wide oval—features a hand-stitched leather frame that is fixed with brass rivets. The leather frame functions like a pocket for the mirror glass, and the natural material will darken over time, giving each mirror a distinct patina. Danish company by Lassen creates furniture and accessories for the modern home. First produced in 2013, the View Mirror takes inspiration from one of Mogens Lassen’s iconic earlier series from 1962—the Kubus candleholders—in its sharp lines and simple silhouette. The View is comprised of lacquered aluminum and mirrored glass and, due to its minimalist structure, almost appears to float when it is hung on a wall. It is available with a black or white frame. Designed by Andrea Stemmer for SCP, the Jules Mirror is an unframed, rectangular portrait mirror that works well in an entryway or above a bureau or vanity. The mirror features a solid oak storage shelf at its base, which can be used to hold knickknacks, makeup, keys, or favorite photographs and postcards. The shelf is made from a single piece of wood and is shaped like a half pipe, which counters the rigid straight lines of the mirror with a warm curvature. The result is a simple and sophisticated mirror that provides practical storage that does not overcomplicate the design. Blending technological innovation with age-old craft techniques, the Stitch Nonagon Mirror adheres a water-jet cut nine-sided mirror to its backing using custom stitched hemp thread. Created by Seattle-based husband and wife design team Chelsea and James Minola of Grain, the mirror is geometric and eye-catching, while still minimalist and able to blend into existing decors. A true piece of art made from an oval stainless steel sheet, folded and polished by hand, the Anamorphosis Mirror creates a silver disc in an angle of the room, like an eyelet opening onto a new moving space. Up close, Anamorphosis is an ideal mirror for make-up, because it shows the three dimensions of the face: the front and both sides. As you move away from it, the oval is distorted and displays moving and fluid images of its environment, until visible from only one place in the room, when the mirror itself becomes a perfect disc. The EDDW Mirror was designed by Tyler Hays for Lostine. It is comprised of a round mirror that is wrapped in leather, and is suspended by a leather harness strap, which rests on a wood puck. The result is a mirror that seamlessly blends modern with rustic—the minimalist round mirror in black leather is met with stitching details and a rustic hanging mechanism. 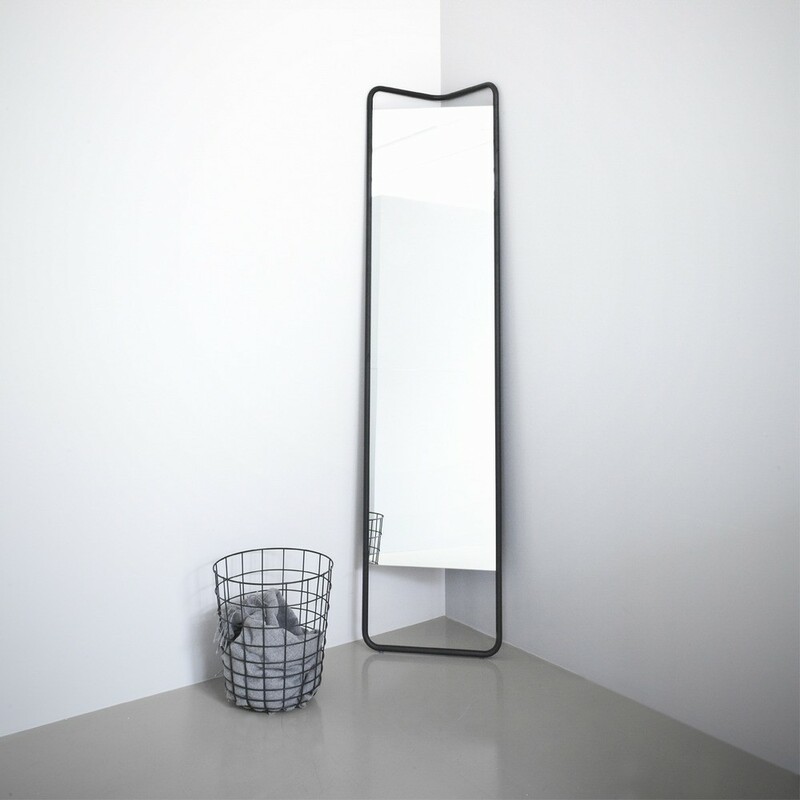 Designed by Stockholm–design studio Form Us With Love, the Cage Mirror is an innovative mirror that is designed to have several looks, depending on the direction from which the mirror is viewed. When looking at the mirror directly, it appears to float from the wall, giving it an unexpected dimension. When viewed from the side, the powder-coated steel framing is revealed behind the mirror, making the otherwise simple mirror appear sculptural. Its rounded corners lend the mirror a softer feel than traditional rectangular mirrors, making it adaptable to a variety of spaces.